From the start of the series unique technologies and bonuses have really helped to shape a civilisation. The dawning of the Forgotten Empires’ expansion increased diversity with the availability of two unique technologies per civilisation; not just for the Goths. Some of these technologies look extremely daunting, one of those being the Malians Farimba which adds +5 attack to stable units. We believe the technology looks a lot more powerful than it is, thanks to the technology tree of the Malians it is actually quite tame; let’s take a look at why! There are a couple of things we need to checkout before we delve into some outright unit comparisons. First thing, if we check the technology tree for the stable Malians do not have access to Paladin or Hussar; this is a serious lack of Imperial Age technology. The other key is the absence of blast furnace. This essentially means they will only have a +3 advantage on their opponent’s stable units, while their infantry line will suffer the disadvantage. 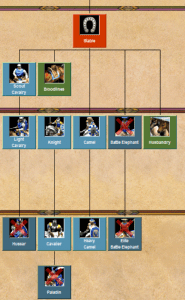 If we check out the fully upgraded knight line from Teutons, Franks and Malians below we can pick some noticeable differences. The downside for the Malians is the fact they will need to have a castle in in order to research their unique technology, none the less it’s still a huge resource savings for the Malians! That’s nearly another 10 fully upgraded cavalier they can have out on the field, add the fact they don’t need to wait for the Paladin upgrade and an early Imperial engagement favors them heavily. They may not be as outright strong but the extra attack makes them a great raiding unit that is quick to tech into; assuming you already have a castle for Farimba. On the topic of raiding units, we should check out the other units that get a great buff from this ability; Hussars and Camels. The extra attack is again offset by the fact the Malians are missing Blast Furnace, but the extra HP gained from Hussar will be the biggest difference they miss out on. It’s super easy to establish the lack of health on the Malian Scout line. This means it’s not going to be quite as good in a straight up fight, especially when there are Pikemen or anything with attack bonuses vs cavalry involved. The extra +3 attack they have on their counterparts makes them an insanely good raiding tool. Villagers, Skirmishers and other low HP vulnerable units will have issues tanking the extra damage giving your opponent less time to react and result in you cutting through the enemy lords trash and economy like butter! The most important unit of note in this entire breakdown is the Camel. This anti-cavalry cavalry unit is a great tool against anyone going down the Knight technology line and an even better counter to Hussars. The Camels quick speed and bonus damage make it a huge threat, adding some extra attack means they will melt all the cavalry unlucky enough to cross paths. Check out the breakdown below to see exactly how much of a boost they get. Your Camels are second to only the Indians & Saracens, every other civilisation will have serious doubts about engaging you with cavalry! This is where the Malians unique technology Farbimba shines; it makes huge difference to the overall ranking of their Camels. The Malian Heavy Camel still manages to do more damage than the fully upgrade Indian Elite Camel, it does fall down in the health comparison which is to be expected; but only against the Indian Elite Camel and Saracens with their Unique Technology. In other instances its surivability is exactly the same and boasting a +3 minimum on every other civilisation, needless to say in late-game you should be controlling the cavalry warfare. Hopefully this little breakdown has stopped you being so scared about some of the new Unique Technologies that were introduced with the expansions. It’s also quite a good guide for how to apply your bonus’ if you random in or choose Malians as your civilisation. The bonus can be applied amazingly well during early Imperial Age using the huge damage bonus to claim serious territory and force an engagement from your opponent before they have the technology to fight back. Your biggest bonus will lay in your Camels, if you see your opponent going down the cavalry line transition into them as early as possible and try to keep your attacks as cost efficient as possible. Once you’ve hit Imperial Age and researched Farimba, that’s your chance to go in hard! Please let us know your opinions on the Unique Technology Farimba below. Do you think it’s strong enough or is it too weak? Should the costs be reduced or increased? Would you prefer to see it changed to a +3 bonus but the Malians receive Blast Furnace?